Wow. Can you believe that summer is already here? Welcome to Summer at WDW. This is a great, red, white and blue time of year to visit Walt Disney World. Walt himself loved America and he really loved July 4. This month we celebrate the spirit of Walt as we take a Red, White and Blue look at Summer at WDW. 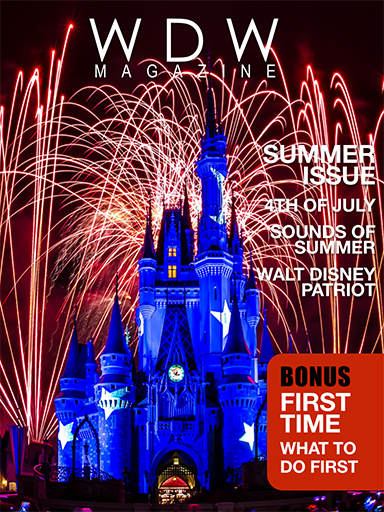 This month you can read all about the patriotic parts of Walt Disney World along with a look at the summer happenings. We also have some really great Best of WDW experiences to share. The Caribbean Beach Resort is our resort of the month, Toy Story Mania the attraction, Le Cellier is the restaurant and World of Disney is the gift shop. Wow what a lineup. Of course we have all of our regular articles with a brand new feature starting this month. A throw down between Disneyland and Walt Disney World. This month we compare the Haunted Mansions. How cool is that? OK, what are you waiting for? Click one of the links below to get started.